World War II veteran and Yokine resident David Lyle with his service medals. The 89-year-old Yokine resident is one of the few surviving World War II veterans who will be in the parade, a tradition he has been involved in since he returned from service in Borneo. ‘I have always attended Anzac Day services each year and my thoughts go back to a lot of those places and to all my mates who shared it with me,’ Mr Lyle said. Mr Lyle joined the Australian Army as a 17-year-old. By the time he turned 18, he had joined the Australian Imperial Force (AIF) and was on a ship to New Guinea with just two weeks combat training under his belt. He said he was one of the few who had previous arms training, having been a member of the Mines Rifle Club. ‘Within weeks of joining the AIF I was on a ship, the Manoora, to Sydney and then onto Milne Bay in New Guinea,’ he said. After a month in New Guinea, Mr Lyle found himself in the line of fire. He was unloading mail with a fellow soldier when they saw a Japanese cruiser sail into shore and fire a few shots, which landed in coconut plantations, and then leave. After a few months, Mr Lyle was sent to fight in Buna and Gona, a battle that lasted months, which he described as ‘terrible’. During the fighting, Mr Lyle said he spent time in army hospitals battling malaria and tropical ulcers. In 1943, he spent a five-week break back in Perth and returned to the front line in Borneo as a part of a convoy of soldiers aboard 180 ships sent to fight the Battle of Balikpapan. He returned as a sergeant to Australia in 1945 where he spent time at a Brisbane convalescent home recovering from malaria. 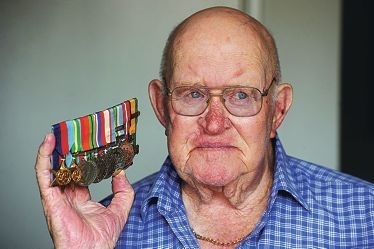 Mr Lyle still bears the scars of the war, having had both legs amputated a few years ago after the tropical ulcers he contracted during his service returned. He will join Thursday’s Anzac Day parade with his daughter Maxine and fellow Yokine RSL members.